medical, clinics, low vision, eye sight impaired, etc. Price: $319.00 incl GST Sorry item out of stock. CAPG009W White Beauty Floor Lamps with 22 watt Lighting and sturdy base. CAPG002B Magnification Floor Lamps (Black). Has a 22 watt globe and a 5 dioptre Glass Lens. CAPG004W Floor Lamps with larger rectangle Lens. Lights consist of 2 x nine watt Bulbs. CAPG005 Portable Desk Lamp. Lighting consists of 14 watt bulb. CAPG005 Portable Magnifiers with LED Lighting (using sixty LED Lights). CAPG006B Table Lamps with 22 watt Light and flexible arm . CAPG008B Light Black Magi on Stand. CAPG008W White Beauty Magi Lights with 5 dioptre lens on Stand. CAPG010 Bench Magnifiers with Light. CAPG012W White Magnifier with 5 dioptre Glass rectangle Lens. 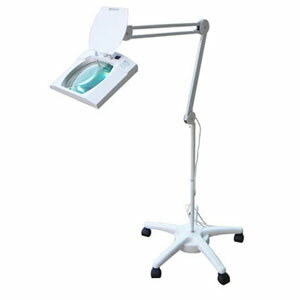 CAPG040 LED White Magnifier with LED Lights consisting of 108 LED diodes and 5 dioptre Glass Lens. Also has a 12 dioptre small detachable Lens. CAPG070 Table Lamps with 12.5 cm lens (made of Glass) and heavy base for stability. Both Lens height and position are adjustable. CAPG090 Table Magnifiers with Lights (108 LED diodes). LED models use less power while providing a whiter and brighter beam. Comes with a round Glass Lens which provides a Magnification of 5 dioptre or 2.2 times. CAPG091 White Floor Lamps with 108 LED Lights consisting of LED diodes. Easily manoeuvrable. CAPG001WL Replacement round 5 dioptre Glass Lens. CAPG003WL Replacement rectangular 5 dioptre Glass Lens. CAPG005L 14 watt Replacement Tube for CAPG005 Light. CAPG030B Black Floor Stand on 5 wheels. CAPG030W White Floor Stand on 5 wheels. CAPG031B Black Light Stand on 4 wheels. CAPG031W White Light Stand on 4 wheels. CAPG051B Black Bench Mount (Heavy duty). CAPG051W White Bench Mount (Heavy duty). CAPG052B Standard Black Bench Bracket. CAPG052W Standard White Bench Bracket. CAPG053 9 watt Light Bulbs with 2 pins for CAPG012 Lamp. CAPG053A 9 watt Light Bulbs with 4 pins for CAPG012 Lamp. CAPG054 22 watt Replacement Tube for Light in CAPG008 Lamp. CAPG056 28 watt Light Bulbs for CAPG010 Lamp. CAPG057B Black mounting Bracket for Desk (screws not included). CAPG057W White mounting Bracket for Desk (screws not included). Order any LED or Fluorescent Magnifying Floor Lamp online for delivery Australia wide. Forms of payments accepted include MasterCard, Visa or PayPal. Payments also accepted via direct bank deposit or cheque. * Bench top, Clamp and Stand alone Light models available. * All items are on display for demo at the Canberra shop.